Dark Thirst slot is all about vampires, and some of the items that provide protection from vampires. Staying true to the genre, with rich graphics and animations that include regular bats flitting across the screen, this slot game features all the expected vampire-associated paraphernalia and images. The game is made by 1×2 Gaming, so you know the gameplay will be smooth and thematically organised. 1×2 Gaming slots are known for their entertainment value and this is enhanced with the creepy sounds expected of vampires. The décor is simple, with the reels framed by stone slabs stolen from the graves, and some dimly lit eerie towers. Everything is framed by a large, full, and vampire encouraging moon. Dark Thirst slot is a standard 5-reel game with up to 25 pay lines. The reels are full of many symbols related to vampirism. Players are entertained with cloves of garlic, holy water, a bible and cross, a cup full of blood that spills on animation, a bat and three eye-catching vampires. The male vampire symbol is worth the most in the base game of this slot machine and pays out 500x the stake placed on that pay line. The Wild symbol is a nightmarish female vampire who reaches out scarily on animation, but actually helps by substituting for any symbol apart from the Scatter and Bonus icons. The Scatter is a tragically pale male vampire, and the Bonus symbol in Dark Thirst slot game is the RIP gravestone. The Scatter symbol is the trigger for the Free Spins feature in Dark Thirst slot game. Three or more Scatter symbols appearing anywhere on the reels is the activator for the Free Spins game. Ten free spins are awarded. The landing of three Scatter symbols also wins a scatter pay-out over and above the prizes achieved during the free spins. The free spins are played automatically, and can be re-triggered. The Bonus game is triggered with the arrival of at least three RIP Bonus symbols on an active pay line. Landing four or five RIP Bonus symbols markedly increases the prizes won during the feature. Certainly one of the more notable features of Dark Thirst slot, this second screen game requires some knowledge of what is happening. The second screen opens up with a darkened graveyard and rows of graves. Players select graves one at a time, and when selected are dug up to reveal a number of different vampires. As each vampire is revealed, players win cash prizes of varying amounts for discovering them. However, one of the grave contains a skeleton, and when this grave is opened, the skeleton is revealed and the Bonus feature ends. Dark Thirst slot game from 1×2 Gaming is another in a game genre that has delivered some excellent slots games. Quality graphics, two bonus features, cute animations and a pleasantly high return to player percentage of 97.32% means that more players than ever are appreciating the range of slots games produced by 1×2 Gaming. Dark Thirst slot is a prime example. The horror elements that will delight all fans of the genre. There are some great rewards, with extra free spins and the chance of winnings being tripled, and also chances of picking bonuses. The theme of this slot machine by 1×2 Gaming is rather clear, and there is another slot machine by the same name in circulation. The concept of celebrities stuck in a jungle setting is obviously very hard to avoid and contains something that attracts slots players. Celebrity In The Jungle slots does not directly mention the show concerned, but certainly has some valuable bonus features that will appeal to all slots players. Celebrity in The Jungle has five reels, set in three rows and with up to twenty five pay lines. The style is cartoonish recognisably of the 1×2 Gaming mould with some delightful animations such as palm fronds blowing in the breeze, and jungle sound effects. The four high value symbols in Celebrity in the Jungle slot are three hapless contestants and an ominous green snake. The lower value symbols on the reels of this game are the standard 9, 10, J, Q, K and A playing card symbols. The Wild symbol in Celebrity in the Jungle slot is a big, clearly labelled Wild symbol, set on a green background. This slots game is endowed with two Scatter symbols, namely a girl with a gold star and the standout symbol, the teeth. Both Scatter symbols activate separate features. The attractive feature of Celebrity in the Jungle slot game is undoubtedly the large number of free spins that available. These are activated by landing three or more of the Girl Scatter symbols anywhere on the reels. Players receive 10 free spins for three scatters, 20 for four and 30 for five Scatter symbols. As can be seen these are seriously high numbers for free spins. What is more, the free spins start automatically when triggered, and all wins achieved during this round are doubled. The Bonus game is triggered with the arrival of three or more of the teeth-eating-a-wichitty-grub Scatter symbols, which is a terribly long name and will be referred to as the Teeth Scatter symbol. Upon activation of this Bonus game, players are taken to a second screen where they are given five boxes that need to be opened one by one. They reveal famous gold stars which are worth cash prizes for the player. The value of the prizes is established by the number of Teeth Scatter symbols in the activating spin. 1×2 Gaming create slots that are designed for their playability and love of the spinning reels. The slots games have a broad range of game play options and can be set to become penny slots, delivering large amounts of slots play for little investment, or, they can be set for white-knuckle gameplay that will suit any high roller worth their salt. Celebrity in the Jungle slot game is comfortable to play and is recognisably from 1×2 Gaming. The graphics and sound are of the expected high quality and despite the theme being slightly over-used at this stage, this slot machine has a special quality to it, which is a particularly high return to player average. The RTP has been audited at 97.70%, which is relatively good for slot machines. Hunt For Gold, created by Play N Go, is an online slot game. It features a theme based around swashbuckling pirate adventure, brought to life by a series of high quality symbols and excellent sound design. It must be said, however, that although the symbols designs are extremely detailed, they might have been a bit more imaginative, especially given the theme. 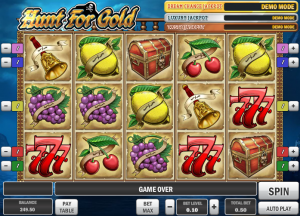 Its all fruit and lucky sevens in Hunt For Gold, which is a touch disappointing. An eye patch wearing pirate certainly wouldn’t have been a bad idea. In terms of play style the game uses a fairly standard five reel, ten play line system. What is interesting, however, is that Hunt For Gold allows very specific control over which betting lines the player would like to use. Other slot games allow only the adding of betting lines, but are not able to select exactly which betting line it is they would like to add. In this game a player may tap or click the exact play line, which will open it up for betting. This is a rather astonishing level of freedom as far as online slot games are concerned. As already said, there are no parrots or cannons to be found in Hunt For Gold, which will surely be missed. What one will notice, however, is that each symbol has been designed with obvious passion and attention to detail, regardless of how bland the subject material is. The most valuable symbol in the game is the lucky sevens, which have been designed to have the sort of dramatic flair used in the hand writing of the old days. The sevens pay out a good amount if matched five times and a decent amount if matched three times, which any online casino guide you read will tell you are decent odds! Next on the list, in terms of payout value, is the bell symbol. This golden bell looks real enough to reach out and touch, and the creepy skull design is remarkably detailed. This is followed by the grapes symbol, the lemon, treasure chest, and cherries. Lets take a look at some of the bonus symbols that will help the player locate a bit of old pirate treasure. A pirate themed game would be nothing without a treasure hunt, and Hunt For Gold is happy to oblige. If the player matches the treasure chest icon a total of five times, a mini-game will be triggered. This involves the player being presented with a treasure map, upon which various locations have been marked. The player must tap or click on three of the icons, to see if they have guessed the location of the treasure. The game is generous, however, and even if the player guesses wrong they will get a bit of money for their trouble. The second bonus symbol is the scatter symbol, represented by a golden wheel. Upon being matched the golden wheel will trigger the spin game. In this game, the player must spin the classic wheel of fortune, which acts exactly as you would expect. The jackpot prize on this wheel, however, is the sort of money a person will be writing home about. 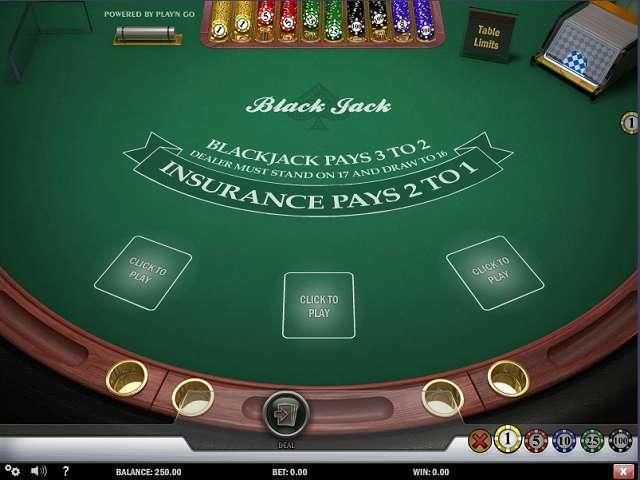 European BlackJack Multi Hand is an online game created by the well known Play N Go Company. It is widely regarded as the preferred way to play blackjack, for those who enjoy an even faster paced game, blackjack already being a fast paced game in its standard form. The standard rules of blackjack are followed, which, as most will know, revolve around getting a hand as close to a total value of twenty one as possible. The player’s hand is put against the house, who then tries to get close to twenty one without exceeding the amount. Should the player be closer to twenty one then the dealer, the player is declared as the winner. In European BlackJack Multi Hand, however, the player is allowed to play three hands simultaneously. This requires three separate ante ups being paid, but likewise gives triple the chance of the player winning during each separate hand dealt. In the case of all three hands winning, the player is granted a bonus, which gives motivation to play the three hand system. If the player wishes, however, they may play only two hands, or even a single hand. But three hands must be played in order for the jackpot to be possible. In European BlackJack Multi Hand the general idea is that the more risk the player takes, the greater the rewards. It is no easy to task to have all three hands win against the house, but the jackpot system makes the risk worthwhile. Likewise, the player is motivated to make each separate hand a winning endeavour, which pushes for the creation of better hands. Keep in mind, however, that the game still follows the basic rules of blackjack, and that sensible strategies should be followed. There are many free strategy guides available online, all of which are completely free. It is strongly recommended that the player learn a blackjack strategy, and use that strategy for European BlackJack Multi Hand. It will grant a tangible advantage for the player, and help them make the most of the game’s three hand system. Be sure to keep in mind that as with all forms of blackjack, European BlackJack Multi Hand has maximum and minimum bet rules. There are multiple tables for the game, all of which have different limits. Be sure to pick a table that is within your betting range, which will help make the game a more enjoyable experience. As a rule of thumb, it is best to select a table that will not spiral out of control in terms of betting amounts, which may send the player into a panic. It is best to instead select a betting amount that is comfortably within amount hat the player is happy with. In this fashion, the player may focus on the game, as apposed to worrying about money. Remember that any European BlackJack Multi Hand table may be left at any time, although bets already placed will be lost if the hand is not properly concluded. Energoonz, created by Play N Go, is an online slot game. It is a remarkably well made online slot game experience, featuring excellent graphics, an extremely unique play style, and an addictive soundtrack that brings the whole experience together. In terms of visual design, Energoonz features a full cast of cute, quirky monsters. The little creatures have all been designed to have unique visual characteristics, as well as a recognisable personality all of their own. Being 3D modelled, and having a full set of animations, a player can quickly get attached to the monsters, and may even feel a little guilty that the game play requires blowing up the creatures to earn payouts. Of course, the Energoonz monsters don’t seem to mind, and will be smiling and laughing the whole way through. The game uses a cascading tile system, as apposed to the standard spinning reel system, which tends to offer a far more intuitive game play feel. Upon a spin being triggered, the monsters will fall from the top of the play area and stack at the bottom. Any matching monsters will be zapped by electricity and explode, leaving empty spaces. This means that more monsters may fall from the top of the play area to fill the gaps, allowing for more matches to be created. Chain these wins together and watch the pay out amount climb. As already mentioned, Energoonz features a cast of monsters. These include a black faces, blue eyed monster, who is the least openly happy of the lot, but certainly the most valuable. Match him to earn quick payouts of a decent amount. Next is a square jawed orange monster, who can often be seen cocking his eyebrow at the player cheekily. Following next is a green, three eyed monster, who will twist his eye stalks to look at the other monsters beside him. The remaining symbols include bolts of lightening, fireballs, and plasma balls. To get the most out of the game, however, one must understand the significance of the plasma ball and bonus system. The plasma ball is a wild tile, and will match with any other tile to form a matching sequence. This in itself allows for easy chained wins in Energoonz, but there is another aspect that makes the game even more generous. Upon a match being created a new plasma ball will be added to the tiles, increasing the chance of further matches being created. Two wins mean, of course, two plasma balls, which will create the perfect scenario for multiple chained wins to be achieved. This will quickly have the tiles falling in quick succession, racking up the cash, and this brings us to the bonus system. Behind the tiles, from top to bottom on one of the reels, the word bonus can be seen. If the entire row in front of the bonus is zapped, an instant bonus round will triggered with fifteen free spins. During a bonus session a second window will open, showing new monsters. If five or more monsters match anywhere in the play area, they payout a bonus amount. 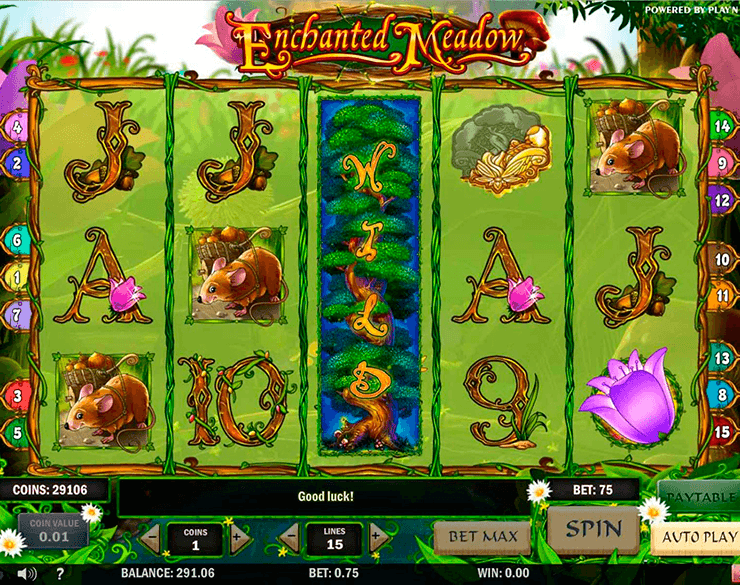 Enchanted Meadow is an online slot game created by Play N Go. It is acclaimed for its extremely well delivered theme, which is based around a forest populated by multiple beautiful fairies. The designs of the fairies is clearly the result of a very talented artist, and each appears to have a personality all of its own. From the prissy blonde fairy to the adventurous black haired fairy, all seem to be part of a delightful story being told via the game images. Look out also for the mouse, who seems to have been employed as a pack mule by the fairies. In terms of game play, Enchanted Meadow uses a standard five reel, fifteen play line system. Note that the play lines may also be manually adjusted, using the interface located near the bottom of the play area. This means that, as the player wishes, they may add or remove betting lines. The result is a game that feels strategic, and this is certainly a plus for those who enjoy their slot games challenging. As already mentioned, Enchanted Meadow is rich with stunning visuals. The already mentioned fairies are the most valuable symbols in the game, starting with the red headed fairy, who seems to be none too shy about going naked. She grants a huge sum of money if matched five times, and good amount even if only matched three times. Next on the list, in terms of payout value, is the black haired fairy, seen with long locks streaming behind her in flight. Last, but certainly not least, is the mouse, who is the least valuable picture symbol. The remaining symbols are the traditional nine, ten, jack queen, king and ace. Much of the card values are similar to those of poker or blackjack online in Canada that you’re familiar with bu in slots, these symbols are the least valuable in the game. Although stylised to fit with the theme, it would have been nice for them to rather have been original picture designs of their own. Note that all the fairies do animate upon being matched, however, which is certainly a welcome touch. In Enchanted Meadow there are three bonus symbols the player will want to keep their eyes open for. The first is the enormous green tree, which looks to be the home of the fairies. It is first a wild symbol, and will match with any other symbol to create a winning sequence. Second, if the tree matches with itself three times, it will not only give a large instant payout, but also trigger a mini game. In the mini-game the player must select from of three flowers, beneath which prizes are hidden. If the correct flower is selected, the largest bonus will be awarded. The second bonus is the water lily icon, which, upon being matched three times, will trigger a second mini-game. This mini-game will grant free spins based upon the fairy the player selects. One free spins are awarded, they will play out automatically, with any amounts won stacked and awarded at the end of the sequence. In other words, choose a favourite fairy and hope she is kind to you. 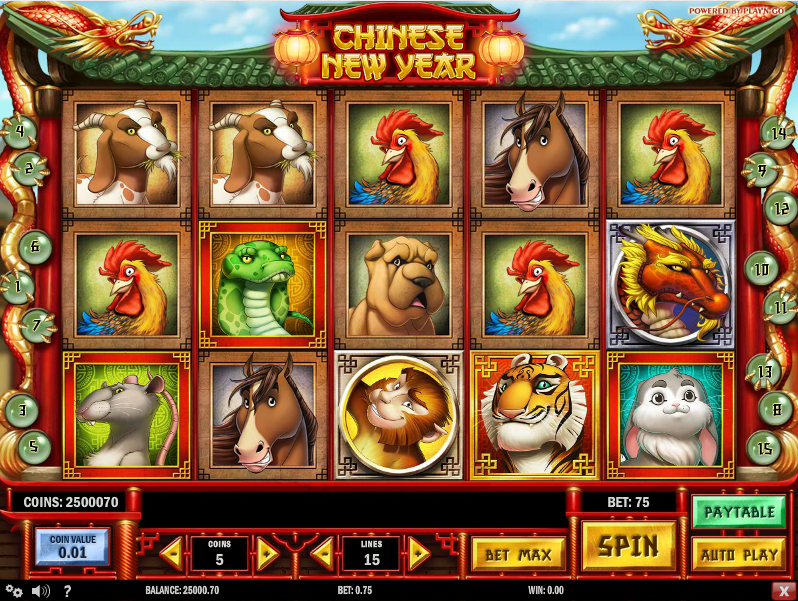 Chinese New Year is a slot game created by Play N Go. It is most well known for its colourful and exceptionally well realised theme, which is, as the name suggests, based around the New Year festivities that occur in China. From dazzling fireworks to an immersive ambient soundtrack, the game all but whisks the player away and transports them to a Chinese New Years party. The symbol designs are also all related to traditional Chinese New Year culture, specifically the animals that mark each year. Each animal is created with high resolution artwork that is extremely impressive, and one cannot help but smile at the adorable antics the animals get up to upon being matched in a winning sequence. In terms of game play a five reel, fifteen play line system is used, with the player given the freedom to select their betting lines individually. This is a good system for those who prefer to have a bit of control over the proceedings. Chinese New Year is available now on desktop computer, mobile phone and tablet. Anyone familiar with Chinese New Year culture knows that each year is assigned an animal. The game takes full advantage of this culture, using charming animals to populate its reels, each of which is straight out of a Disney animated movie in terms of style. The most valuable standard symbol in the game is the rat, who looks more then a little sneaky. He will pay an enormous amount if matched the maximum of five times, and a more modest amount when matched the minimum of three times. Next of the list, in terms of value, is the bull, followed by the adorable rabbit, the snake, the horse, the goat, the chicken, the dog, and the pig. The pig, sadly, although seeming to be a very happy character, got the short end of the stick and came up as the least valuable symbol. In order to really take advantage and earn some money in Chinese New Year one must look towards the bonus symbols. The tiger is the wild card in Chinese New Year. He can, first of all, be matched with himself three times for a massive jackpot payout. He may also match with any other symbol to form a matching sequence, acting as a substitute. The second bonus symbols to look out for are the cheeky monkeys, who, upon matching three times, wll trigger a bonus mini-game. This mini-game involves spinning a wheel of fortune, which has the potential to grant enormous jackpot payouts that will certainly put a smile on the player’s face. Last, but certainly not least, is the dragon. The dragon symbol, known to be good luck in China, will trigger the ultimate mini game upon being matched. This mini-game is told in the style of three fireworks cannons, lined up and ready to fire. The player must select one of the cannons, which will fire and explode a firework in the sky. Upon exploding, a bonus number will be revealed, which indicates how much bonus cash the player has raked in. Since 1996, Net Entertainment has been developing a variety of casino products for the online gaming market. Net Entertainment is a Swedish software provider with headquarters located in Stockholm, and this developer creates slots for players and casinos across the globe. The company is well known for its online slot games, which offer innovative bonus features and quality graphics. Some of NetEnt’s other well-known products include live casino games, a Net Entertainment online progressive network, and the NetEnt Touch platform for mobile casino gaming. In 2013, Net Entertainment launches Starburst mini slot game online. This followed the success of the original Starburst slot, which played out over 5 reels and 10 paylines. Some of the bonus features in the game include win both ways symbols, reel re-spins, stacked reel symbols, and the special Starburst expanding wild feature. If an expanding Starburst wild symbol lands on reels 2, 3 and 4, a re-spin will also be awarded to give players the chance to land extra winning combinations. The design of the original Starburst slot is bright and colourful, and its graphics may remind players of an arcade-style video game full of jewels. Net Entertainment launches Starburst mini slot game as a miniature version of the original Starburst slot. This adjusted game fits into a much smaller area than the original slot, offering simpler graphics and less distraction. The design of the Starburst mini online slot has been slimmed down to the basics, but the game still contains classic Starburst symbols and bonus features. Again, the action takes place over 5 reels and 10 paylines, and players can land special Starburst wilds on the three centre reels during the base game. The key feature of the Starburst mini slot game from NetEnt is its versatility. NetEnt has designed this slot to be much easier to play, allowing players to play slots and complete other activities at the same time. For example, if a player wanted to bet on sports and play the Starburst mini slot at the same time, they could. The small window of the Starburst mini slot would take up only a portion of players’ screens, allowing them to wager, read, work or chat while they play for real money online. As well as the mini version of the game, players can also play the original Starburst slot online, as well as a mobile optimised version at the NetEnt Touch mobile gaming platform. At the time Net Entertainment launches Starburst mini slot game, a number of other ventures were in play for this Swedish slots developer. One of these ventures was the successful South Park online slot, a licensed slot game based on the TV show of the same name. The South Park slot follows the adventures of Stan, Kenny, Kyle and Cartman, playing out over 5 reels and 25 paylines. The bonus features in this game include free spins, wild symbols, sticky wilds and 3 mini bonus features. Net Entertainment is an online casino developer based in Sweden. Since 1996, Net Entertainment has catered primarily to a market of online casino players by creating online video slots that can be played for real money. As well as their large portfolio of online slots, NetEnt are also known for their live casino and mobile casino products. The NetEnt Live Casino allows online players to play casino games aided by a video stream of a real dealer, while the NetEnt Touch platform caters to players using mobile phones and tablets. Licensed in Malta, NetEnt also owns one of the largest progressive jackpot networks on the web, which has been estimated to have paid out millions to online players. Aliens is an American military science fiction film released in 1986. The film soon became a blockbuster, inspiring many pop culture references, including the Aliens online slot from Net Entertainment. Starring Sigourney Weaver as the film’s main character, Aliens explores the horror story of Ellen Ripley and Corporal Dwayne Hick’s battle against a nest of malicious Aliens. This cult classic film is the theme of the official Aliens slot, containing many of the same characters and scenes as the original motion picture. Players will be able to fill the role of Ellen Ripley in the game, hunting down the Aliens’ Queen and destroying The Hive in order to win cash prizes. Net Entertainment launches official Aliens slot during 2014. The game is another of this developer’s many licensed slots, joining titles like South Park and Scarface. 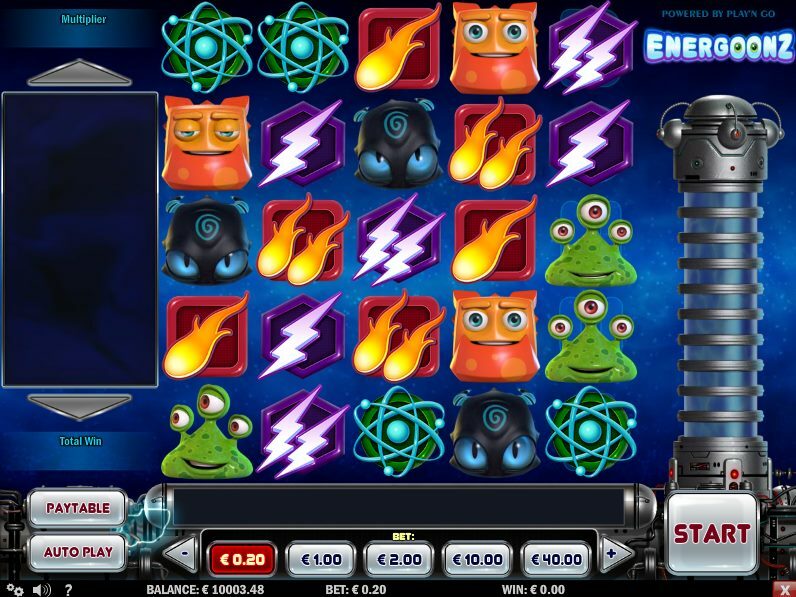 The official Aliens slot was launched at the ICE 2014 conference in London, where it was revealed to the public along with several of Net Entertainment’s other innovations at the time. Aliens is credited with being the first NetEnt slot to offer players real time 3D graphics, which make for a realistic gaming experience from any online platform. The game is available for both desktop and mobile casinos, and players can play for real money at casinos offering this slot. The official Aliens online slot plays out over 5 reels, 3 rows and a total of 15 paylines. The game has a different structure to many traditional slots, however. Players of Aliens will be given the chance to play through several different levels in order to increase the value of their wins. Each level of the game is themed after an iconic scene from the movie, Aliens, including scenes like The Search, The Encounter, and The Hive. Just like in the film, players’ objective will be to hunt down and kill the Queen of The Hive, which will award them a jackpot prize of 240x their stake. The symbols on the reels of this slot include a selection of alien eggs and adult Aliens, as well as a wild symbol and collectable multipliers. Re-spins and bonus cash prizes will also be awarded throughout the game. Net Entertainment launches Marvellous Mr Green slot exclusively for the Mr Green online casino. Marvellous Mr Green is a branded online slot game that is now only available at Mr Green who originally was an exclusive Net Entertainment online casino. They now have online casino games developed by other leading names such as Microgaming, IGT Gaming, Bally and Quickspin amongst others. Net Entertainment launches Marvellous Mr Green slot to the specifications of Mr Green with ease of access for all of their new and existing players. The game is predominantly coloured in green and showcases the main character with typical Net Entertainment quality. The game features are not incredibly unique but they do possess the characteristics of a Net Entertainment online slot game which any player with Net Entertainment experience can expect. Net Entertainment launches Marvellous Mr Green slot as an online slot game paying homage to the Mr Green online casino. The background and certain images representing the symbols are coloured in green while the trimmings and playing card icons are coloured in gold. Net Entertainment launches Marvellous Mr Green slot with a themed based around Mr Green who is considered an illustrious gentleman, an adventurer extraordinaire and a casino maestro. The symbols depict his big lifestyle with a classic green luxury car, a small green plane that flies around the globe, representations of his luxurious mansion and gold bars depicting his wealth. There are also symbols representing his green umbrella and his green bowling hat. The Marvellous Mr Green online slot game has five reels and three rows with twenty pay lines. Ten coins is the maximum allowed on each pay line but the coin values vary. They start at 0.01 and end with the maximum coin value of 0.50. Net Entertainment launches Marvellous Mr Green slot with a variety of standard special features that include wilds, scatter wins, free spins and multipliers. The special symbols are the wilds, scatter and the free spins multiplier meters. The wild symbol is standard and replaces any regular symbols where a winning combination is possible. The scatter symbol pays out up to 100x for appearing three or more times and it triggers the free spins bonus when three or more are present on the reels. The number of free spins awarded is not initially known as they continue until a free spins multiplier meter symbol that displays a stop sign shows up. These multiplier meter symbols will only appear on reel five and when they do they offer increased multipliers of up to 6x. Net Entertainment launches Marvellous Mr Green slot with a special random multiplier feature. A random multiplier of 1x, 2x, 3x or 5x may be randomly awarded at any time a spin produces a winning combination during the main game. The only exception is if a scatter combination lands. The random multiplier may also be awarded before any spin occurs which will then apply to that particular spin only regardless of whether a winning combination lands or not.